After a week of humidity and thunderstorms, Friday dawned with clear skies. Sandy had come out earlier in the week but didn't get a chance to fly here. I knew from the website that the guys had talked about skipping work early on Friday and heading out for some afternoon ridge soaring. I hustled out there by 2:30 or so, thinking I was late, but the wind was actually too strong, and we waited for a couple of hours watching the hangies sky out to cloudbase. Finally the wind backed off to a nice level, and the five of us launched for a prolonged session of sweet ridge lift, sprinkled with fat and gentle thermals. 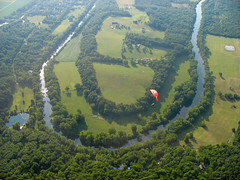 By the end of our two hour flight the whole valley was lifting off, and we could just boat around high above the lazy curls of the Shenandoah River in the fading light. Thanks to Hugh, Charlie, Laszlo, Tom and Jim for getting me back into the air in my old home state. And thanks to President Hugh for the post flight refreshment and the ride up to my car. Well done, Alex. Very nice site pics.